An amber snail's egg batch. Picture: Anne Möhler. Of all native terrestrial snails, amber snails have the closest connection to water, but still they never actually live in the water, though they may live on plants growing there. Amber snails have got a thin walled translucent shell often amber coloured, whose spire usually is very small compared to the huge apertural whorl. An amber snail's aperture rim is sharp and there is no apertural lip. In this regard, amber snails are similar to pond snails (Lymnaeidae). Between different populations there may often be extreme, even hereditary, differences in size, which sometimes makes the determination of species very difficult. Similar to glass snails (Vitrinidae), in some exotic genera of the amber snail family there is a vitrinisation of different degrees: In those groups there are semi-slugs as well as complete slugs. Like other pulmonate terrestrial snails, amber snails also are hermaphrodites. They become sexually mature when they have reached half their final shell size. But amber snails have got two separate sexual openings, the female one lying above the male one. Though the sperm cells mature before the egg cells, apart from mutual fertilisation, there may also be auto-fertilisation, which only serves population increase. The common amber snail (Succinea putris) mates between May and September. Later, about 20 to 30 longish eggs in yellow batches are laid on stones, water plants and on the ground. After about a fortnight, the juvenile snails will hatch. They reach maturity in one year. Francisco Welter-Schultes: Succinea putris species homepage. A natural habitat of amber snails. The exact separation of the different species of amber snails, however, remains very unclear. On one hand, the different species externally are very similar. Besides, most amber snail species are quite variable in their appearance. 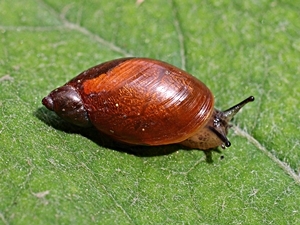 For example, the common amber snail (Succinea putris) may have a shell height of between 10 and 17 mm, as does the slender amber snail (Oxyloma elegans) with 9 to 17 mm. While the former two species are usually quite easily distinguished in their shell form, in other cases a clear distinction is only possible with anatomical means. Apart from that, many amber snail findings so far have not yet been confirmed by anatomical examinations. Therefore, the distribution of amber snails lastly remains unsecure. So there still is a large need for research, as well concerning amber snail ecology, as the distinction of species. Mollusc of the Year 2012: Slender Amber Snail (Oxyloma elegans) (PDF, 720 KB) (In German). Description: The common amber snail has a yellowish amber coloured shell, which grows a little larger than shells of the Oxyloma genus. The spire only takes about one third of the overall shell height. The aperture is widely oval, the last whorl is bulbous. The snail itself is of a reddish to yellowish colour, becomes lighter at the sides and does not show dark spots. Specimens living near the water are darker, specimens from farther away are coloured lighter. Succinea putris is a potential intermediate host of the trematode Leucochloridium paradoxum (see above). Dimensions: H: 10 - 17 mm; W: 6 - 8 mm; N: 3 - 4. Maximal shell height up to 27 mm. (Abbreviations). 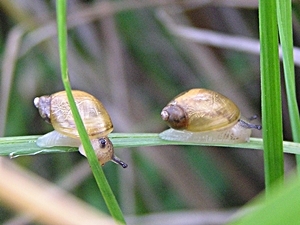 Habitat and Distribution: The common amber snail lives on reed and other plants standing near the water, on constantly humid meadows, in alluvial forests and in forests on swampy ground. The snail often crawls up plant stems and can hibernate in a noticeable distance from the next water. The snail crawls slowly and when disturbed only withdraws a little. The common amber snail is quite widely distributed. It appears in Europe, in West and North Asia, but not on parts of the Mediterranean peninsulas, as little as in northern Scotland, the Hebrides, the Orkneys and Shetlands, and neither in the north of Scandinavia. Threat Situation: In Great Britain the species locally is in decline, because of its habitats' destruction. In Ticino in Switzerland it is critically endangered (CR), in Bulgaria, it is rare. 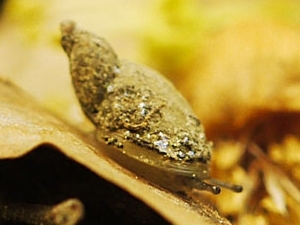 Description: The slender amber snail has a pale yellow to greyish green shell with few whorls. The aperture is elongated and oval, in all, the shell appears conical. The snail itself has a dark colour, with many dark spots on the back. Oxyloma elegans is a potential intermediate host for the trematode Leucochloridium macrostomum. Oxyloma elegans. Picture: Helmut Nisters. Dimensions: H: 9 - 17 mm; W: 6 - 8 mm; N: < 3. Maximal shell height up to 20 mm. (Abbreviations). 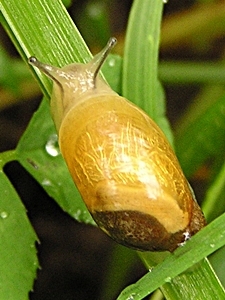 Habitat and Distribution: The slender amber snail is more closely bound to water than Succinea putris. 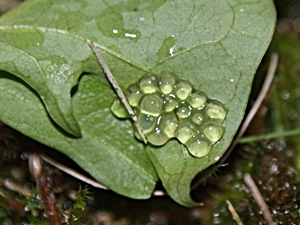 It lives rather on the ground, but also often on plants standing in the water. It tolerates temporary flooding and also lives in places with little vegetation cover. It feeds on wilting plant parts. Oxyloma elegans is distributed from North Africa over Europe as far as North Asia, but is missing in the north of Scandinavia. Threat Situation: The slender amber snail in Austria is classified as near threatened (warning list). Francisco Welter-Schultes: Oxyloma elegans species homepage. Reddish amber snail (Oxyloma sarsii). Picture: © Alexander Mrkvicka, Vienna (mrkvicka.at). Description: The reddish amber snail is only a little different from the slender amber snail. The shell form is basically comparable. As the name already states, the shell of Oxyloma sarsii is rather reddish amber coloured. An unambiguous separation from other Oxyloma species must take place based on an anatomical examination. The reddish amber snail's body is also quite dark coloured and wears dark spots on the back. Dimensions: H: 10 - 15 mm; W: 6 - 9 mm; N: < 3. Maximal shell height up to 20 mm. (Abbreviations). 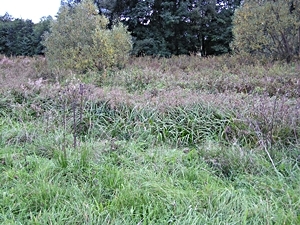 Habitat and Distribution: The reddish ambers snail's habitat are river and lake side areas free of vegetation, where the species follows the water line and never goes far from water. Mostly the snail crawls on plants standing in the water. The species' distribution areas covers Northwest- and East Europe as far as northern Siberia, as well as the Danube area. In Germany there are only few disperse populations, from Schleswig-Holstein as far as the Danube valley. Possibly the species also appears in Northern Italy. But while it is missing in Ireland, it does appear in the south-east of England. Threat Situation: In South-East England, the few remaining populations of the species are located in two limited areas and they are threatened by the constant destruction of habitats by water pollution and constructions around the water bodies. The reddish amber snail in Rhineland-Palatinate and in Lower Saxony is endangered, in England and in the rest of Germany, it is vulnerable (see also: IUCN Threat Categories). Francisco Welter-Schultes: Oxyloma sarsii species homepage. Small amber snail (Succinella oblonga). Description: The small amber snail near the coast has an intensively amber coloured shell. In the inner country, the shell usually is more of a pale greyish yellow, but can also have a reddish amber colour. 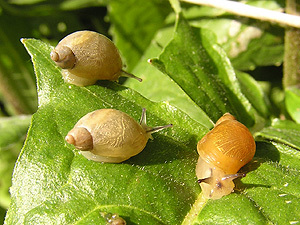 The small amber snail is noticeably smaller than Succinea and Oxyloma species. From outside, the shell of a small amber snail resembles that of the sand bowl snail (Catinella arenaria), but it shows more whorls, the embryonic spire is more symmetric and the whorls extend slower. In General, the shells of the same height of a small amber snail have more whorls. An unambiguous identification, however, can only take place by an anatomical examination. The snail's body is yellowish grey and there are dark spots on its back. The sides of the foot are lighter coloured. Dimensions: H: 5 - 8 mm; W: 3.0 - 4.5 mm; N: 3½ - 4. (Abbreviations). Small amber snail (Succinella oblonga) in camouflage. Picture: © Stefan Haller (schneckenfoto.ch). 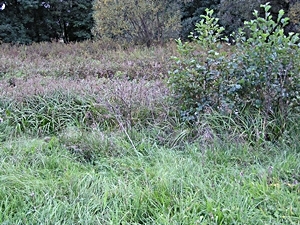 Habitat and Distribution: The small amber snail lives on the ground, often in humid and open places, also with little vegetation cover. Often, the snail is found in temporary flooded places, also in wet cattle pastures. 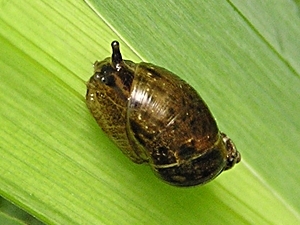 Generally, the small amber snail of all amber snails is the species least depending on water. It also appears in warm and dry places, such as gardens, on stones and walls, e. g. of ruins, as well as in hedges and on trees. There it often coats its shell with earth and faeces, on one hand for camouflage, on the other, to protect itself against dryness. The small amber snail mainly feeds on green algae and decaying plant matter. The juveniles are predominantly distributed by birds. Succinella oblonga is distributed in nearly all of Europe and North Asia. In Turkey it is rare, in Portugal it only appears in the north. In Scandinavia it lives as far north as 61° n. lat. In Switzerland, small amber snails live in altitudes of up to 2100 m MSL. Threat Situation: The small amber snail disappears soon, when the habitat changes, but then it can occupy other habitats as fast by being distributed by birds. 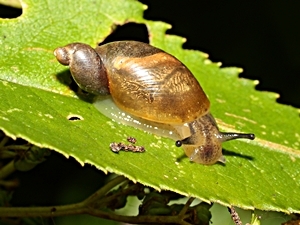 In the English lowlands, the small amber snail was common during the ice age, but in the following postglacial, its populations declined because of the forests growing. Later, there was an increase again as a consequence of pre-Roman and Roman time expansion of human settlements and pushing back of forests (similar to the Roman snail). Today the species is in decline again because of the destruction of its habitats. The small amber snail is vulnerable in Bavaria, near threatened in Austria (warning list) and rare in Great Britain. Francisco Welter-Schultes: Succinella oblonga species homepage. Sand bowl snail, Catinella arenaria (Bouchard-Chantereux 1837): In dunes near the coast, disperse and rare. Atlantic coastal regions from the Bay of Biscay until Norway, Öland and Gotland; single populations also in the inner country, such as Switzerland and Central Slovakia. Their life near water makes amber snails ideal intermediate hosts for parasitic worms such as distomes (Trematoda), whose larval stage (miracidium) lives in the water, but who finally infects a warm blooded animal, such as a bird or a mammal. spec. Picture: Christian Fuchs . A special example is the distome Leucochloridium paradoxum, which as final hosts infects song birds as an intestinal parasite. 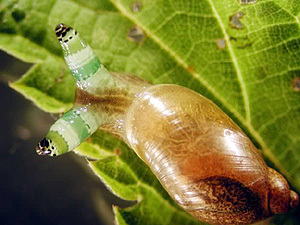 The larvae (miracidia) in the water infect amber snails, in whose main digestive gland they develop into the next larval stage, the so-called cercariae. Those gather in long sporocyst tubes which may stretch as far as into the snail's tentacles. Those then swell extensively and cannot be withdrawn any more. Additionally, the snail's behaviour is altered, so, against its custom, it crawls out into the open and remains there unprotected. The sporocyste tubes pulsating inside the tentacles attract birds which peck at the tentacles and thus are infected themselves. Inside the bird's intestine, the cercaria develops into an adult distome, which then reproduces sexually. With the bird's faeces, the eggs are dispersed and the miracidia hatching from them are ready to infect another snail.